The small white building was once used to entertain guests by the owner that named the cocktail-serving bar the Honey House back in the 1920s. It still has the beautiful old stone fireplace which now heats the space in winter through the use of a wood-burning stove which has been inserted into the hearth. This keeps the space comfortably warm, so I can work there throughout even the coldest winter days. My stepdaughter Indigo insisted on using the Honey House, in more primitive (and much colder) conditions, as sleeping quarters during her adolescence. From the outside, the Honey House looks like it could be a small schoolhouse or chapel. The building is a few steps above the driveway and halfway between the main house and the guest house at the end of a straight inclined stone driveway. 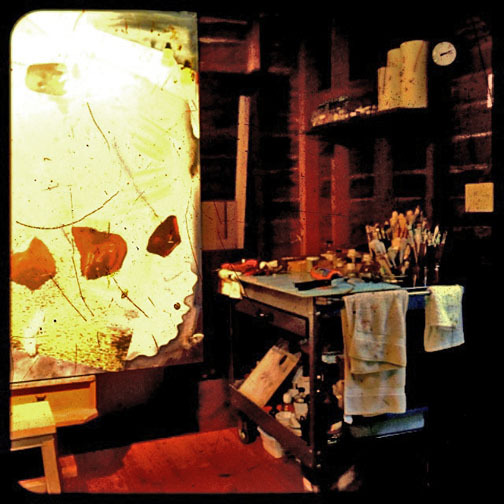 The typical cleaning out, throwing away, re-doing the floor, and painting transformed the lovely little building into a studio for drawing and assemblage box construction. The Honey House was quickly determined to be too small for all of my artistic pursuits. Once Laurel mentioned the idea of transforming the storage shed adjacent to the main house, we began the process of emptying out an accumulation of seventy years of stuff, including a long-dead mummified possum! A floating pine floor was put in with flagstone placed in the corner on which a small wood-burning stove now sits. Lights and a ceiling fan were installed before filling the space with canvases, equipment, and supplies.